July 13, 2017 — The University of Houston Law Center was honored recently with the inaugural State Bar of Texas IP Section Annual Trademark Award for its defense of the school's brand after South Texas College of Law announced plans to change its name to Houston College of Law. 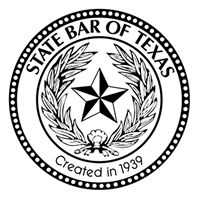 "I am very thankful that the Texas Bar recognized the Law Center for protecting its name and brand," said Dean Leonard M. Baynes "The case presented important and novel legal issues. The Law Center community is deeply grateful for the expert legal representation by UH General Counsel Dona Cornell and UHLC alumni Tony Buzbee and Al Deaver. Our success is solely attributable to their outstanding lawyering and advocacy. " "The presentation of this award is not about highlighting a winner or a loser in a lawsuit," Craig Stone, chairman of the IP Law Section's Trademark Committee, said in announcing the award during the state bar's annual meeting last month in Dallas. "It's to recognize the exceptional work of a team of in-house lawyers, brand guardians and outside counsel collaborating and taking action under expedited deadlines to gather evidence and meet a burden of proof in the context of a trademark injunction hearing. "Their representation of the UHLC brand under emotion-filled circumstances is a great example of what trademark lawyers and teams face every day when tasked with protecting their multi-generational assets as brand stewards," added Stone, senior counsel, Intellectual Property, for Phillips 66 in Houston. After a successful federal district court judgment in UHLC's favor, the two law schools ultimately settled the case and agreed on the name South Texas College of Law Houston. "This case was a huge win for the University of Houston and the University of Houston Law Center in protecting its valuable brand and reputation it has worked so hard to achieve in the higher education and legal community," said Cornell, UH System Vice Chancellor for Legal Affairs, UH Vice President for Legal Affairs, and UH System/UH General Counsel. "We knew this case had to be aggressively pursued by a powerhouse of attorneys and the collective support of the administration at UH and the UH Law Center. Tony Buzbee showed why he has a reputation for truly being one of the best litigators around. The specialized IP and litigation experience offered by Al Deaver and his team at Sutton, McAughan, Deaver, as well as the knowledge of UH trademarks by Jennifer Sickler at Thompson & Knight were critical to a favorable ruling by (U.S. District) Judge (Keith) Ellison. "Additionally, Dean Baynes' exceptional leadership and the support of his staff working with my office and outside counsel throughout the litigation made this a true team win for which UH and the UH Law Center should be proud." "I was honored to serve as lead counsel for this important and unique case," said Buzbee, a 1997 Law Center graduate. "The team involved in this effort are some of the best in the IP field. The support we received from the chancellor, the dean, and their staffs were top notch and most appreciated. And I would be remiss to fail to mention General Counsel Dona Cornell. In my estimation she is the absolute best. We are very pleased with the result of the case."